If you're one of the millions looking for a mid-sized sedan to suit your lifestyle, there are probably a few things on your list of "must haves." Great gas mileage, plenty of amenities, and space to spare being just a few. With these features in mind, the 2018 Volkswagen Passat stands out as a sedan perfect for the American lifestyle. The new 2018 Volkswagen Passat features two engine options: a new 2.0-liter TSI turbocharged four-cylinder and an available 3.6-liter VR6. The first of which has a peak horsepower of 174 and a maximum torque of 184 lb-ft. It allows the Volkswagen Passat to get 25 mpg in the city and 36 mpg on the highway. The second engine, the 3.6-liter VR6, comes with the 2018 Volkswagen Passat GT and has a peak horsepower of 280 and a torque of 258 lb-ft. The mileage is an EPA estimated 19 mpg in the city and 28 mpg highway. Both of these options make the 2018 Volkswagen Passat a great choice for all matter of driving. 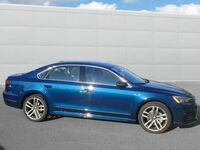 The 2018 Volkswagen Passat also features Volkswagen Car-Net, a feature designed to improve the intelligence and connectivity of vehicles and their systems. Also available on select models are a number of security features that link the 2018 Volkswagen Passat to your phone, allowing you more control remotely. The 2018 Volkswagen Passat has ample space for five adults and the ability to accommodate 15.9 cubic feet of luggage in the trunk. This combined with available perforated V-Tex leatherette seating allows passengers to feel comfortable on trips of all lengths. The MIB II infotainment system offers one of the most comprehensive suites of connected services and features available today. With all the features of the Volkswagen Car-Net platform and an available 6.3-inch touchscreen display, you'll never lack for entertainment on your journey. These features combined with its sleek, yet powerful appearance makes the 2018 Volkswagen Passat an attractive vehicle for any lifestyle. Contact us at Dirito Brothers Volkswagen for your test drive today!